The HTC One Max has appeared once again on film, with the super-sized smartphone shown off in comparison with a few of its big-screen rivals. The image shows the HTC One Max compared to the Samsung Galaxy Note 3 and Note 2. This is the first time we have been able to get an idea of the size of the device and, well, it's going to be big. It looks longer than the Note 2 and a tad thicker but that could be down to the angle of the photograph. The HTC One Max hasn't been announced by HTC yet. But, this leak further proves that the Taiwanese manufacturer is gunning for the bigger than a phone, not quite a tablet middle market (we aren't going the mention the 'p' word). There is also rumour that HTC is set to bring its stylus back, last seen on the largely forgotten HTC Flyer, presumably so HTC fans can have play sword fights with their Samsung S Pen wielding mates. Other features are set to include a fingerprint scanner (the leak shows one on the back of the handset), 4G connectivity and the fact this will be a single SIM device. Previous leaks had hinted at a two-SIM setup. 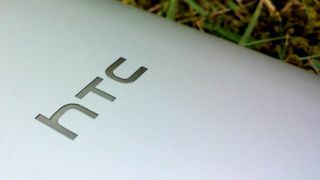 HTC seems to be betting big (literally) on its One brand, having already released the HTC One mini earlier in the year, but there's no word at the moment when the HTC One Max will be officially announced. Like things BIG? then check out our hands on: Galaxy Note 3 review.